Gartner: "There was no particular motivation for U.S. consumers to purchase PCs in the first quarter of 2016." Analyst firms IDC and Gartner said Monday that the PC market continues to sharply decline, as unit sales plunged between 10 and 12 percent during the first quarter. Of note, however, was Dell’s resurgence as the top U.S. PC vendor, after HP split into two business units. IDC reported that PC sales fell 11.5 percent to 60.6 million units during the first quarter, while Gartner said that sales fell by 9.6 percent to 64.8 million units—dropping below the number of PCs sold during 2007. “There was no particular motivation for U.S. consumers to purchase PCs in the first quarter of 2016,” said Mikako Kitagawa, the principal PC analyst at Gartner, in a statement. As bad as it was, both firms reported that sales were in line with expectations. The two firms reported that a number of factors impeded sales: a lull before Windows 10 upgrades in the enterprise take place, a deterioration in foreign currencies, weak consumer demand, and a holdover of aging PC inventory that simply wasn’t purchased during the fourth quarter. 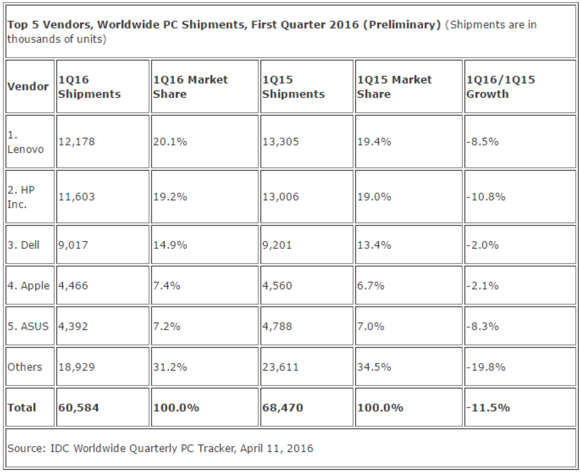 Gartner’s estimates of worldwide PC sales for the first quarter of 2016. Analysts hope that at least some of those factors will vanish in the coming months. “With some IT buyers thinking about early Windows 10 transitions and with the potential continued ascent of Chromebooks in U.S. K-12, the PC market should experience a modest rebound in the coming months,” IDC’s Linn Huang, the research director covering devices and displays, said in a statement. Why this matters: The most damning statement is that consumers had “no particular motivation” to buy a PC during the fourth quarter. That was when hardware vendors were pushing PCs running Intel's new “Skylake” CPUs and Microsoft's new Windows 10. The entire argument behind these new machines was that aging, five-year-old systems should be replaced. Consumers didn't buy that argument, nor did they buy as many PCs as vendors hoped. Lenovo leads worldwide, but not in the U.S.
Worldwide, Lenovo remained the top PC vendor, though its shipments dropped 7.2 percent to 12.5 million units. The only vendors that showed any signs of life were Asus and Apple—though IDC and Gartner ranked each differently: Gartner said Apple finished fifth, with 4.6 million units, while IDC ranked Apple fourth, with 4.5 million PCs sold. The story for the U.S. market is how HP slipped out of first place. Within the United States, Lenovo showed enormous growth: an almost unheard-of 21 percent increase in PC shipments from 2015 to 2016. According to IDC’s data, that propelled Lenovo into the third spot in U.S. shipments, just above Apple. 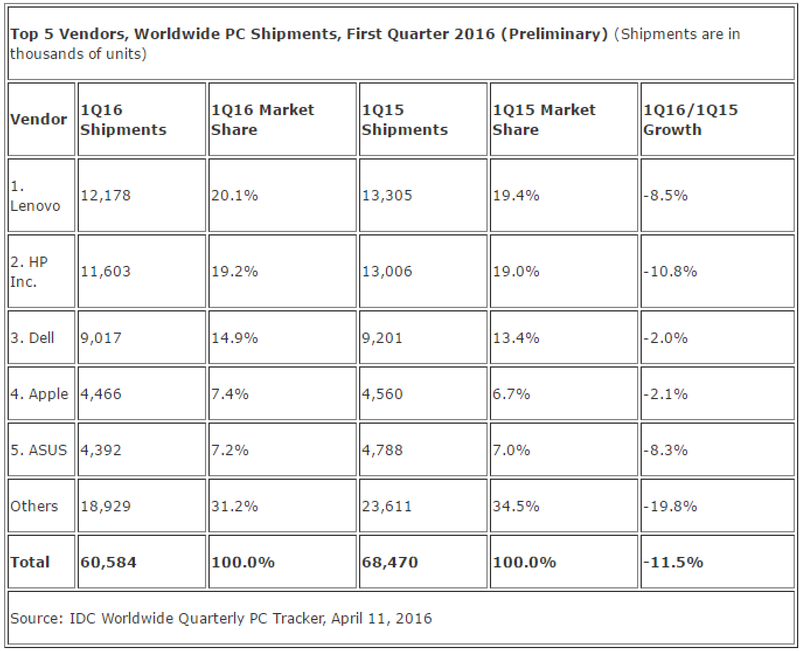 Overall, U.S. PC shipment volume was the lowest in three years, falling 6.6 percent to 13.1 million units, according to Gartner. That, and the fall of HP Inc., were the stories of the fourth quarter. HP, navigating through its split with the enterprise side of the business, saw PC sales fall 14.1 percent according to IDC (or a drop of 17.3 percent, according to Gartner), pushing it from first to second in U.S. PC sales. HP sold 3.1 million PCs, according to Gartner, compared to 3.5 million for Dell, which saw modest growth of between 3 to 4 percent. 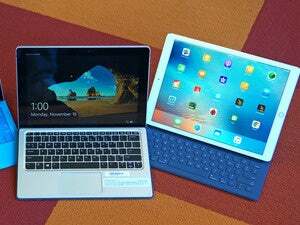 IDC placed Apple over Asus in first quarter 2016 U.S. PC sales. “Vendors that had a strong consumer focus struggled to increase sell-in shipments,” Gartner’s Kitagawa said. Stronger sales of two-in-one PCs didn’t offset the decline in overall shipments, she said. Updated at 4:41 PM with additional details.